Hello, a few weeks ago i downloaded WPU & start using it, love it.... yeah After using it for a while, i had a few problem, finally fixed it... in that time got some ideas what could be done to improve it. Why i CANT REPAIR / MODIFY bitdefender from WPU, but i CAN from windows? Before we released the first version of WPU, we have considered this Backup/Restore feature. But finally we didn't add it. How to back up before uninstall a program? Back up all files? It will costs more time and disk space. Create a System Restore point? If user stops Windows System Protection, we can not create a restore point. If user install a program in a non-system drive, system restore point cannot restore the program. We know, Windows can not keep unlimited system restore point records, depends on the system drive space, when the records over the limitation, the earliest record (the first one system restore point record) will be removed. So, we add the uninstallation Log feature, you can know those be uninstalled programs, and you can re-install them by yourself. Which settings do you want us to add? I think WPU is very easy to use. No need additional settings. Change color, maybe we can add it. About modify Bitdefender, we will test it and fix it in next update. You cant allways re-install programs because NO RESIDUAL ITEMS is displayed. That why i suggest BACKUP button like WRC has it. Whit 1 click, program should make FULL REGISTRY BACK UP & SYSTEM RESTORE POINT (if system restore point is DISABLED in win, the pop out windows should ask if you wanna ANABLE IT?, same like in WDC, if you click NO then just Registry backup is made). I like WPU very much, but its annoying that i have to open WRC first to make BACKUPS, then open WPU and uninstal the program. Needed 1 day to fix the PC. if posible to add a "click" option on AUTO BACK UP Full Registry before cleaning & AUTO BACK UP System Restore Point, like WRC has it. You can safely choose what the WPU will AUTO backup before you uninstall anything. I think this is very nice & easy option without of aditional clicking. (my idea is: i open WPU & uninstall any program (WPU makes AUTO backups before my uninstallation), i close WPU. If something is wrong & not working, i open WPU and use RESTORE button. After i did REPAIR INSTALATION on Bitdefender AV on 11/6/2014, WPU shows WRONG / OLD instalation date 11/5/2014. WPU 1.64 DELETED Adobe Flash Player & part of NeXus Program while Uninstalling MSXML 4.0 SP3 Parser & using Safe Uninstall option. PS: i Also needed 2 WIN UPDATES (KB2972216 & KB2894854), .NET Framework 4.5, 4.5.1 - was deleted or damaged - dont know exactly!!! PPS: PLEASE add AUTO BACKUP option for Registry & System Restore Point, before uninstalling begins!!! This is the 2nd time now, that i have to install damaged Programs all over again & try to fix WPUs damage. Have PRT SC but there is nothing to see! Any way of adding a feature to show or not show Security and Windows Updates? It would be highly unlikely that anyone would uninstall them and it takes quite a bit of space up that you have to scroll though. I would suggest a feature for WPU: can you add the possibility to uninstall multiple applications (or updates)? I have to uninstall 50 updates and now I have to do it manually for each entry. It would be nice if you can select all entries you want and then the program uninstall them automatically, one by one. Windows system doesn't support it, programs should be uninstalled one by one. But I will reported it to our developer team, maybe they have some good ideas. Please add an option to start with the programs list sorted by date/size/name. Are you trying to update from v1.82 to v1.83, directly from the program? Or are you using the browser, from WiseCleaner download center (click)? The three links (about WPU) on it are working, at least now. If they don't work for you: what firewall and what antivirus are you using? The program does not always removes empty folders after uninstalling. When installing multiple programs leave empty folders. 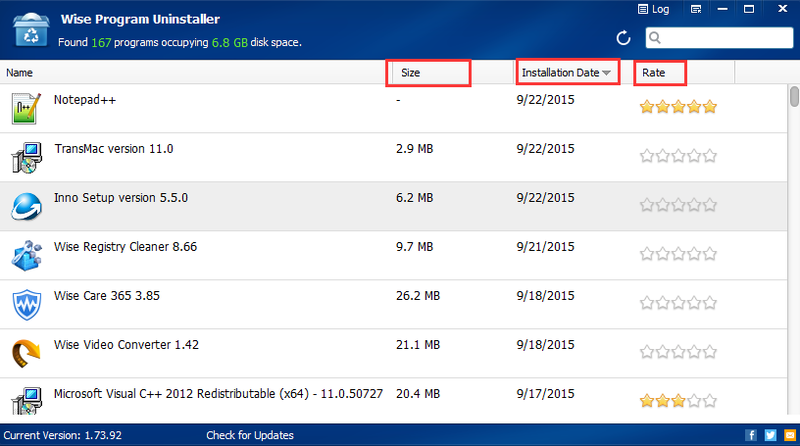 A competitive program "BCUninstaller" removes properly. Can you tell me which program's empty folder not be removed after uninstalling? Name and version, we will check it. You said, 'when uninstall multiple programs leave empty folders', so, I want to know those empty folders belong to which programs. If you don't remember the name, never mind. Next time, when you use WPU to uninstall a program, but don't remove the program's folder, please notice to us. We will check and improve WPU. It remained a program folder in the folder "C:\\ProgramData"
I really-really like this product! I will me writing about it here. Merry-Merry Christmas and a happy new year, 2016! Hugs. Maybe the update isn't available yet, if the page is blank (it's usual).